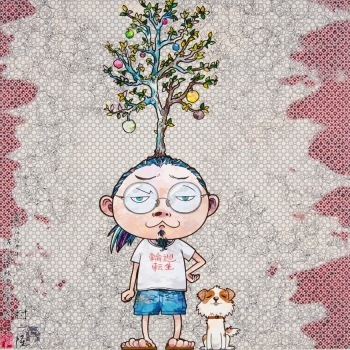 From today on, Blum & Poe presents Arhat, an exhibition of new painting and sculpture by Takashi Murakami. The cycle of paintings continue Murakami’s newest mode of painting, developed for his exhibition Ego, mounted in Doha, Qatar in early 2012. The Arhat paintings conflate historical, contemporary, and futuristic Japanese references with a myriad of styles, methodologies, and forms into single picture planes. 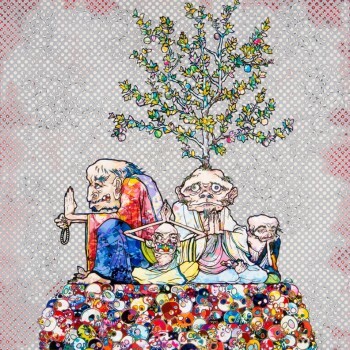 The artist’s long-standing interest in Japanese nihonga painting and the contemporary practices of manga and animation are highlighted in this important body of work. Arhat, which derives its name from the ancient language of Sanskrit, translates to “a being who has achieved a state of enlightenment.” Taken as a whole, Arhat articulates more than twenty years of Murakami’s mastery of melding form, content, history, and methodology into a succinct body of work. Murakami distills his signature “Superflat” style into a reflection on high, middle, and lowbrow culture.